American music superstar Tom Petty’s lake house near Malibu is for sale and featured this week at TopTenRealEstateDeals.com. Tom Petty’s lake house near Malibu is for sale at $5.895 million. It never occurred to Tom Petty that gathering a group of friends to play music wouldn’t make them big stars. After meeting Elvis at the age of 10 and later watching the Beatles, he knew he was meant to be a musician and approached it with laser focus. In the late 60s at age 17, Tom put his theory into practice gathering several buddies, took guitar lessons, added a few more instruments to the mix and was soon on his way to stardom. Tom’s first band, the Epics, started out in his hometown Gainesville, Florida playing between odd jobs to keep them financially afloat until they hit the big time, which he knew in his heart was just a matter of time. The Epics evolved into Mudcrutch, a popular band at the University of Florida area bars, but failed to get outside attention. His next band, the Heartbreakers, quickly turned things around making it to the top in 1976 with their hit song “Breakdown.” Tom and the Heartbreakers never looked back producing classics such as “American Girl,” “Free Falling,” and “I Won’t Back Down.” A career that lasted over 45 years. Petty died in October at age 66 and now his Lake Sherwood getaway near Malibu is for sale. Built in 1931 with walls of local field stone, Petty’s retreat has mountain and water views across the natural lake from almost every room and 125-feet of shorefront. Deceptively large at 5,300 square feet, the house has three bedrooms and three baths and underwent an expansion in 2004. Its rustic feel from the field stone and natural wooded environment is complimented by its balcony fireplace, redwood-paneled bath with stone bathtub that overlooks the lake and vaulted-beamed ceilings and fireplace in the field stone living room. It’s a California house with a European mountain and lake chalet vibe from its barrel-tiled roof to its private deep-water dock and enchanting terrace. 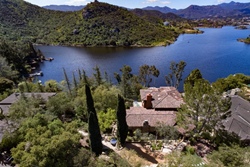 Rock and Roll superstar Tom Petty’s Lake Sherwood retreat near Malibu is listed at $5.895 million. Listing agents are Dana Sparks and Amy Alcini of Compass Realty in Malibu, California.